I am glad to meet up with you and share what we have been making. 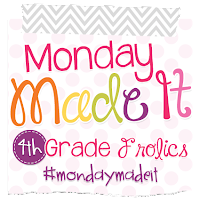 Thanks to Tara at 4th Grade Frolics for hosting this linky! This is one of our favorite times of year, berry pickin' time. Every summer, our family goes strawberry picking and this year is no exception. We caught wind of a local berry farm that was selling their berries for $1.00 a pound. I know...right...cheap! It was weedy. It was mosquitoey. It was a bit harder than normal, but for $1 a pound, I am not complaining. We bought 11 pounds and went back for more. With all this "hull"abaloo, we made a strawberry rhubarb upside down pie, YUM! We made a strawberry rhubarb pie, double YUM! YUM! Then we made freezer jam. With a child apartment bound with homemade jam, who could resist having that in their freezer? 1 box yellow cake mix...mix as directed. Pour into 9 x 13 pan.. Put 3 cups of rhubarb on top of the batter. Add 1 cup of sugar. Next, pour 1 pint of whipping cream over all of it. Bake as directed or a bit longer. This cake forms an upside down cake that is soooo moist. Enjoy your Monday! I am glad we made it!